Benno Janssen and Franklin Abbot of Pittsburgh designed the 23-story hotel in 1915, originally called the Fort Pitt Hotel. The Prohibition-era speakeasy - discovered during a renovation – has no record of an architect, likely due to its illegal nature. Architects Janssen & Cocken added an annex on to Grant Street while Joseph Urban added the Urban Room, both in 1929. The "Speakeasy" Social Lounge was a popular spot during prohibition from 1920 until December of 1933 when the act was abolished. 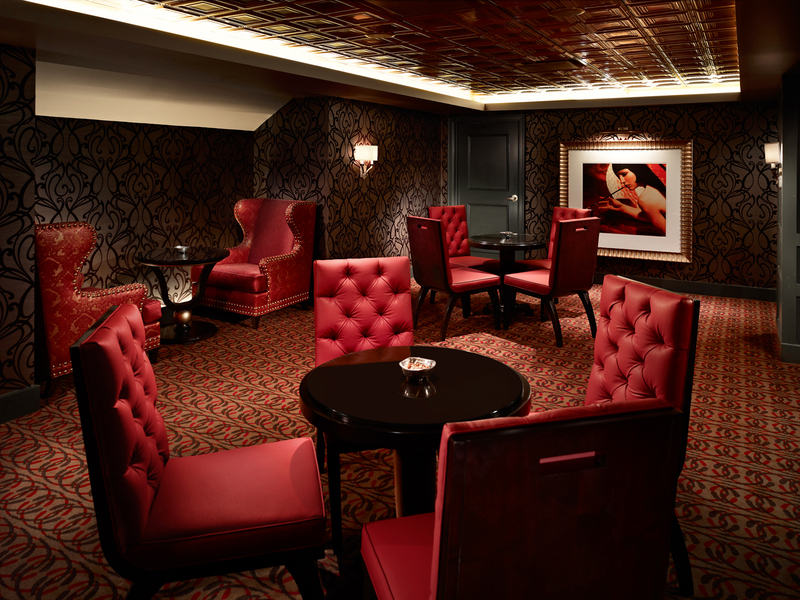 Discreetly tucked under the main stairwell of the hotel, it has been refurbished for a new generation, yet takes us back to a time gone by when patrons secretly gathered to enjoy their favorite libations, and share stories of their daily toils in life. The Speakeasy serves prohibition style cocktails in a classic setting. Guests will enjoy viewing signature label Whiskey from back in the early 1900's, as well as Prohibition Prescriptions. The Omni William Penn is Pittsburgh’s premier historic hotel. The hotel opened on March 9, 1916, and has played a significant role in the history and growth of our city. The Omni William Penn has served as host over the years to numerous icons of business and industry. It was, and remains today a favorite of movie stars, entertainers, and politician’s. Every seated President since Theodore Roosevelt has been to the hotel. Built by Industrialist Henry Clay Frick, the hotel was fashioned after some of the finest hotels in Europe that Frick visited during his extensive travels. The hotel at one point contained 1,600 guest rooms, and was the largest hotel in the Eastern half of the United States. It was one of the very first hotels to boast of private bathrooms in each guest room, as well as electric certified lighting. Upon opening, the hotel offered every service imaginable, and was essentially a self-contained city in miniature. Private quarters for staff, a private sitting room and library, and a complete printing facility to produce advertising and menus were all within the walls. A bakery to produce fresh bread, a butcher, a candlestick maker, a silversmith and a locksmith were all employed by the hotel. There was also a barbershop featured on the lower level, a manicure parlor, a drug store, and a billiards room. On opening night, 800 staff members were employed to welcome guests and be at their service. A guest room on opening night was $2.50, and the most expensive Suite was $50.00, a staggering amount at the time. Recently celebrating her Centennial Anniversary, this Grande Dame” as the Omni William Penn is affectionately known as, is poised to serve its guests for the next 100 years and beyond.